Black Pepper, shown, is described as "an exquisitely warm and deeply spiced fusion of essential oils that spins a web of earthy delights". The notes include coriander, cumin, oakmoss, patchouli, violet leaf, bergamot and ginger. Cool is "a cool breeze on a hot summer's day... chilled droplets of dew on the grass at dawn", and includes cardamom, wild mint, tangerine and warm cedarwood. Black Pepper & Cool are $45 each for 50 ml of Eau de Toilette, and are available now at beautyhabit. Spend $75 or more on Molton Brown, and get a free 100ml Rosé Granati Fine Liquid Hand Wash. They already have a range of toiletries smelling of Black Pepper, haven't they? I expect people wanted an EDT that went with them. Sounds lovely. Yes, they do, but can't remember if I've smelled it. Hoping they'll do that Rose Granati in a fragrance for women, although I did smell the hand wash and the fragrance is VERY subtle. The BP shower gel is lovely. I agree with you about Rose Granati: it's my favourite hand cream. Favorite hand cream because the cream itself is so great, or because of the fragrance? I tried a bit in a Molton Brown store but wasn't sure it was heavy duty enough for me…I usually use Weleda Skin Food, which is basically like Crisco. A bit of both, really. I nominated it as my find of 2005, last year. I find it so pleasant to use. True, it's quite light, but then I don't need anything too thick (I always wear gloves when I do the washing up and I don't have a garden, so it suits me fine). I also like the oilier M&S Royal Jelly hand cream when I want a cream I can rub into my nails. And I use Ange's Spa Raw Sugar lotion at night. That's right — I forgot, but that is probably where I first heard of it. My hands are a mess, so it probably isn't enough for me, but will keep hoping for the EdT. good,I'm glad they're releasing this because I'm a huge fan of the Black Pepper Body wash. Ugh. 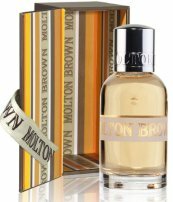 I love Molton Brown. I'll have to smell it then, thanks! Uh-oh, cumin! My skin seems to love making this note go front and center on me. Tauer's Desert au Marocain is a prime example. Black Pepper is worth a try at 45 bucks though. Hopefully the coriander and ginger tones the cumin down. I don't always have good luck with cumin either…just depends on how much. Love coriander & ginger though, so will have to try it!